This article is about the sandwich. For the meat served as part of such a sandwich, see Patty. For other uses, see Hamburger (disambiguation). A hamburger (short: burger) is a sandwich consisting of one or more cooked patties of ground meat, usually beef, placed inside a sliced bread roll or bun. The patty may be pan fried, grilled, or flame broiled. Hamburgers are often served with cheese, lettuce, tomato, onion, pickles, bacon, or chiles; condiments such as ketchup, mayonnaise, mustard, relish, or "special sauce"; and are frequently placed on sesame seed buns. A hamburger topped with cheese is called a cheeseburger. The term "burger" can also be applied to the meat patty on its own, especially in the United Kingdom, where the term "patty" is rarely used, or the term can even refer simply to ground beef. Since the term hamburger usually implies beef, for clarity "burger" may be prefixed with the type of meat or meat substitute used, as in beef burger, turkey burger, bison burger, or veggie burger. The term hamburger originally derives from Hamburg, Germany's second-largest city. In German, Burg means "castle", "fortified settlement" or "fortified refuge" and is a widespread component of place names. The first element of the name is perhaps from Old High German hamma, referring to a bend in a river, or Middle High German hamme, referring to an enclosed area of pastureland. Hamburger in German is the demonym of Hamburg, similar to frankfurter and wiener, names for other meat-based foods and demonyms of the cities of Frankfurt and Vienna respectively. The term "burger" eventually became a suffix back-formation that is associated with many different types of sandwiches, similar to a (ground meat) hamburger, but made of different meats such as buffalo in the buffalo burger, venison, kangaroo, turkey, elk, lamb or fish like salmon in the salmon burger, but even with meatless sandwiches as is the case of the veggie burger. 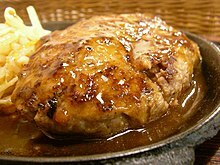 Hamburg steak has been known as "Frikadelle" in Germany since the 17th century. The "Hamburger Rundstück" was popular already 1869, and is believed to be a precursor to the modern Hamburger. There have been many claims about the origin of the hamburger, but the origins remain unclear. The popular book "The Art of Cookery made Plain and Easy" by Hannah Glasse included a recipe in 1758 as "Hamburgh sausage", which suggested to serve it "roasted with toasted bread under it". A similar snack was also popular in Hamburg by the name "Rundstück warm" ("bread roll warm") in 1869 or earlier, and supposedly eaten by many emigrants on their way to America, but may have contained roasted beefsteak rather than Frikadeller. Hamburg steak is reported to have been served between two pieces of bread on the Hamburg America Line, which began operations in 1847. Each of these may mark the invention of the Hamburger, and explain the name. There is a reference to a "Hamburg steak" as early as 1884 in the Boston Journal. [OED, under "steak"] On July 5, 1896, the Chicago Daily Tribune made a highly specific claim regarding a "hamburger sandwich" in an article about a "Sandwich Car": "A distinguished favorite, only five cents, is Hamburger steak sandwich, the meat for which is kept ready in small patties and 'cooked while you wait' on the gasoline range." According to Connecticut Congresswoman Rosa DeLauro, the hamburger, a ground meat patty between two slices of bread, was first created in America in 1900 by Louis Lassen, a Danish immigrant, owner of Louis' Lunch in New Haven. There have been rival claims by Charlie Nagreen, Frank and Charles Menches, Oscar Weber Bilby, and Fletcher Davis. White Castle traces the origin of the hamburger to Hamburg, Germany with its invention by Otto Kuase. However, it gained national recognition at the 1904 St. Louis World's Fair when the New York Tribune referred to the hamburger as "the innovation of a food vendor on the pike". No conclusive argument has ever ended the dispute over invention. An article from ABC News sums up: "One problem is that there is little written history. Another issue is that the spread of the burger happened largely at the World's Fair, from tiny vendors that came and went in an instant. And it is entirely possible that more than one person came up with the idea at the same time in different parts of the country." Louis Lassen of Louis' Lunch, a small lunch wagon in New Haven, Connecticut, is said to have sold the first hamburger and steak sandwich in the U.S. in 1900. 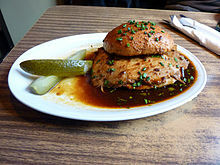 New York magazine states that "The dish actually had no name until some rowdy sailors from Hamburg named the meat on a bun after themselves years later", noting also that this claim is subject to dispute. A customer ordered a quick hot meal and Louis was out of steaks. Taking ground beef trimmings, Louis made a patty and grilled it, putting it between two slices of toast. Some critics like Josh Ozersky, a food editor for New York Magazine, claim that this sandwich was not a hamburger because the bread was toasted. One of the earliest claims comes from Charlie Nagreen, who in 1885 sold a meatball between two slices of bread at the Seymour Fair now sometimes called the Outagamie County Fair. The Seymour Community Historical Society of Seymour, Wisconsin, credits Nagreen, now known as "Hamburger Charlie", with the invention. Nagreen was fifteen when he was reportedly selling pork sandwiches at the 1885 Seymour Fair, made so customers could eat while walking. The Historical Society explains that Nagreen named the hamburger after the Hamburg steak with which local German immigrants were familiar. According to White Castle, Otto Kuase was the inventor of the hamburger. In 1891 he created a beef patty cooked in butter and topped with a fried egg. German sailors would later omit the fried egg. The family of Oscar Weber Bilby claim the first-known hamburger on a bun was served on July 4, 1891 on Grandpa Oscar's farm. The bun was a yeast bun. In 1995, Governor Frank Keating proclaimed that the first true hamburger on a bun was created and consumed in Tulsa, Oklahoma in 1891, calling Tulsa, "The Real Birthplace of the Hamburger." Frank and Charles Menches claim to have sold a ground beef sandwich at the Erie County Fair in 1885 in Hamburg, New York. During the fair, they ran out of pork sausage for their sandwiches and substituted beef. Kunzog[who? ], who spoke to Frank Menches, says they exhausted their supply of sausage, so purchased chopped up beef from a butcher, Andrew Klein. Historian Joseph Streamer wrote that the meat was from Stein's market not Klein's, despite Stein's having sold the market in 1874. The story notes that the name of the hamburger comes from Hamburg, New York not Hamburg, Germany. Frank Menches's obituary in The New York Times states that these events took place at the 1892 Summit County Fair in Akron, Ohio. Fletcher Davis of Athens, Texas claimed to have invented the hamburger. According to oral histories, in the 1880s he opened a lunch counter in Athens and served a 'burger' of fried ground beef patties with mustard and Bermuda onion between two slices of bread, with a pickle on the side. The story is that in 1904, Davis and his wife Ciddy ran a sandwich stand at the St. Louis World's Fair. Historian Frank X. Tolbert, noted that Athens resident Clint Murchison said his grandfather dated the hamburger to the 1880s with 'Old Dave' a.k.a. Fletcher Davis. A photo of "Old Dave's Hamburger Stand" from 1904 was sent to Tolbert as evidence of the claim. Various non-specific claims of invention relate to the term "hamburger steak" without mention of its being a sandwich. The first printed American menu which listed hamburger is said to be an 1834 menu from Delmonico's in New York. However, the printer of the original menu was not in business in 1834. In 1889, a menu from Walla Walla Union in Washington offered hamburger steak as a menu item. Between 1871 and 1884, "Hamburg Beefsteak" was on the "Breakfast and Supper Menu" of the Clipper Restaurant at 311/313 Pacific Street in San Fernando, California. It cost 10 cents—the same price as mutton chops, pig's feet in batter, and stewed veal. It was not, however, on the dinner menu. Only "Pig's Head," "Calf Tongue," and "Stewed Kidneys" were listed. Another claim ties the hamburger to Summit County, New York or Ohio. Summit County, Ohio exists, but Summit County, New York does not. 1921: White Castle, Wichita, Kansas. Due to widely anti-German sentiment in the U.S. during World War I, an alternative name for hamburgers was Salisbury steak. Following the war, hamburgers became unpopular until the White Castle restaurant chain marketed and sold large numbers of small 2.5-inch square hamburgers, known as sliders. 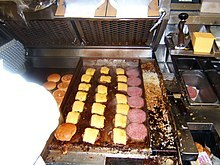 They started to punch five holes in each patty, which help them cook evenly and eliminate the need to flip the burger. In 1995 White Castle began selling frozen hamburgers in convenience stores and vending machines. 1923: Kewpee Hamburgers, or Kewpee Hotels, Flint, Michigan. Kewpee was the second hamburger chain and peaked at 400 locations before World War II. Many of these were licensed but not strictly franchised. Many closed during WWII. Between 1955 and 1967, another wave closed or caused changes of name. In 1967 the Kewpee licensor moved the company to a franchise system. Currently only five locations exist. 1936: Big Boy. In 1937, Bob Wian created the double deck hamburger at his hamburger stand in Glendale California. Big Boy would become the name of the hamburger, the mascot and the restaurants. Big Boy expanded nationally through regional franchising and subfranchising. Primarily operating as drive-in restaurants in the 1950s, interior dining gradually replaced curb service by the early 1970s. Many franchises have closed or operate independently, but at the remaining American restaurants, the Big Boy double deck hamburger remains the signature item. 1940: McDonald's restaurant, San Bernardino, California, was opened by Richard and Maurice McDonald. Their introduction of the "Speedee Service System" in 1948 established the principles of the modern fast-food restaurant. The McDonald brothers began franchising in 1953. In 1961, Ray Kroc (the supplier of their multi-mixer milkshake machines) purchased the company from the brothers for $2.7 million and a 1.9% royalty. 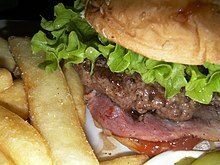 Some restaurants offer elaborate hamburgers using expensive cuts of meat and various cheeses, toppings, and sauces. One example is the Bobby's Burger Palace chain founded by well-known chef and Food Network star Bobby Flay. Hamburgers are often served as a fast dinner, picnic or party food and are often cooked outdoors on barbecue grills. In Finland, hamburgers are sometimes served in buns made of rye instead of wheat. A high-quality hamburger patty is made entirely of ground (minced) beef and seasonings; these may be described as "all-beef hamburger" or "all-beef patties" to distinguish them from inexpensive hamburgers made with cost-savers like added flour, textured vegetable protein, ammonia treated defatted beef trimmings (which the company Beef Products Inc, calls "lean finely textured beef"), advanced meat recovery, or other fillers. In the 1930s ground liver was sometimes added. Some cooks prepare their patties with binders like eggs or breadcrumbs. Seasonings may include salt and pepper and others like as parsley, onions, soy sauce, Thousand Island dressing, onion soup mix, or Worcestershire sauce. Many name brand seasoned salt products are also used. Raw hamburger may contain harmful bacteria that can produce food-borne illness such as Escherichia coli O157:H7, due to the occasional initial improper preparation of the meat, so caution is needed during handling and cooking. Because of the potential for food-borne illness, the USDA recommends hamburgers be cooked to an internal temperature of 160 °F (71 °C). If cooked to this temperature, they are considered well-done. A veggie burger, black bean burger, garden burger, or tofu burger uses a meat analogue, a meat substitute such as tofu, TVP, seitan (wheat gluten), quorn, beans, grains or an assortment of vegetables, ground up and mashed into patties. A steak burger is marketing term for a hamburger claimed to be of superior quality. or, in Australia, a sandwich containing a steak. Steak burgers are first mentioned in the 1920s. Like other hamburgers, they may be prepared with various accompaniments and toppings. Use of the term "steakburger" dates to the 1920s in the United States. In the U.S. in 1934, A.H. "Gus" Belt, the founder of Steak 'n Shake, devised a higher-quality hamburger and offered it as a "steakburger" to customers at the company's first location in Normal, Illinois. This burger used a combination of ground meat from the strip portion of T-bone steak and sirloin steak in its preparation. Steak burgers are a primary menu item at Steak 'n Shake restaurants, and the company's registered trademarks included "original steakburger" and "famous for steakburgers". Steak 'n Shake's "Prime Steakburgers" are now made of choice grade brisket and chuck. Beef is typical, although other meats such as lamb and pork may also be used. The meat is ground or chopped. In Australia, a steak burger is a steak sandwich which contains a whole steak, not ground meat. Steak burgers may be cooked to various degrees of doneness. Steak burgers may be served with standard hamburger toppings such as lettuce, onion, and tomato. Some may have additional various toppings such as cheese, bacon, fried egg, mushrooms, additional meats, and others. Various fast food outlets and restaurants ‍—‌ such as Burger King, Carl's Jr., Hardee's, IHOP, Steak 'n Shake, Mr. Steak, and Freddy's ‍—‌ market steak burgers. Some restaurants offer high-end burgers prepared from aged beef. Additionally, many restaurants have used the term "steak burger" at various times. Some baseball parks concessions in the United States call their hamburgers steak burgers, such as Johnny Rosenblatt Stadium in Omaha, Nebraska. Burger King introduced the Sirloin Steak sandwich in 1979 as part of a menu expansion that in turn was part of a corporate restructuring effort for the company. It was a single oblong patty made of chopped steak served on a sub-style, sesame seed roll. Additional steak burgers that Burger King has offered are the Angus Bacon Cheddar Ranch Steak Burger, the Angus Bacon & Cheese Steak Burger, and a limited edition Stuffed Steakhouse Burger. In the United States and Canada, burgers may be classified as two main types: fast food hamburgers and individually prepared burgers made in homes and restaurants. The latter are often prepared with a variety of toppings, including lettuce, tomato, onion, and often sliced pickles (or pickle relish). French fries often accompany the burger. Cheese (usually processed cheese slices but often Cheddar, Swiss, pepper jack, or blue), either melted directly on the meat patty or crumbled on top, is generally an option. Other toppings can include bacon, avocado or guacamole, sliced sautéed mushrooms, cheese sauce, chili (usually without beans), fried egg, scrambled egg, feta cheese, blue cheese, salsa, pineapple, jalapeños and other kinds of chili peppers, anchovies, slices of ham or bologna, pastrami or teriyaki-seasoned beef, tartar sauce, french fries, onion rings or potato chips. Standard toppings on hamburgers may depend upon location, particularly at restaurants that are not national or regional franchises. Pastrami burgers may be served in Salt Lake City, Utah. A patty melt consists of a patty, sautéed onions and cheese between two slices of rye bread. The sandwich is then buttered and fried. A slider is a very small square hamburger patty sprinkled with diced onions and served on an equally small bun. According to the earliest citations, the name originated aboard U.S. Navy ships, due to the manner in which greasy burgers slid across the galley grill as the ship pitched and rolled. Other versions claim the term "slider" originated from the hamburgers served by flight line galleys at military airfields, which were so greasy they slid right through you; or because their small size allows them to "slide" right down your throat in one or two bites. In Alberta, Canada a "kubie burger" is a hamburger made with a pressed Ukrainian sausage (kubasa). In Minnesota, a "Juicy Lucy" (also spelled "Jucy Lucy"), is a hamburger having cheese inside the meat patty rather than on top. A piece of cheese is surrounded by raw meat and cooked until it melts, resulting in a molten core of cheese within the patty. This scalding hot cheese tends to gush out at the first bite, so servers frequently instruct customers to let the sandwich cool for a few minutes before consumption. A low carb burger is a hamburger served without a bun and replaced with large slices of lettuce with mayonnaise or mustard being the sauces primarily used. A ramen burger, invented by Keizo Shimamoto, is a hamburger patty sandwiched between two discs of compressed ramen noodles in lieu of a traditional bun. In Mexico, burgers (called hamburguesas) are served with ham and slices of American cheese fried on top of the meat patty. The toppings include avocado, jalapeño slices, shredded lettuce, onion and tomato. The bun has mayonnaise, ketchup and mustard. In certain parts are served with bacon, which can be fried or grilled along with the meat patty. A slice of pineapple is also a usual option, and the variation is known as a "Hawaiian hamburger". Some restaurants' burgers also have barbecue sauce, and others also replace the ground patty with sirloin, Al pastor meat, barbacoa or a fried chicken breast. Many burger chains from the United States can be found all over Mexico, including Carl's Jr., Sonic, as well as global chains such as McDonald's and Burger King. Hamburgers in the UK and Ireland are very similar to those in the US, and the High Street is dominated by the same big two chains as in the U.S. — McDonald's and Burger King. The menus offered to both countries are virtually identical, although portion sizes tend to be smaller in the UK. In Ireland the food outlet Supermacs is widespread throughout the country serving burgers as part of its menu. In Ireland, Abrakebabra (started out selling kebabs) and Eddie Rocket's are also major chains. An original and indigenous rival to the big two U.S. giants was the quintessentially British fast-food chain Wimpy, originally known as Wimpy Bar (opened 1954 at the Lyon's Corner House in Coventry Street London), which served its hamburgers on a plate with British-style chips, accompanied by cutlery and delivered to the customer's table. In the late 1970s, to compete with McDonald's, Wimpy began to open American-style counter-service restaurants and the brand disappeared from many UK high streets when those restaurants were re-branded as Burger Kings between 1989 and 1990 by the then-owner of both brands, Grand Metropolitan. A management buyout in 1990 split the brands again and now Wimpy table-service restaurants can still be found in many town centres whilst new counter-service Wimpys are now often found at motorway service stations. Hamburgers are also available from mobile kiosks, commonly known as “burger vans", particularly at outdoor events such as football matches. Burgers from this type of outlet are usually served without any form of salad — only fried onions and a choice of tomato ketchup, mustard or brown sauce. Chip shops, particularly in the West Midlands and North-East of England, Scotland and Ireland, serve battered hamburgers called batter burgers. This is where the burger patty, by itself, is deep-fat-fried in batter and is usually served with chips. Hamburgers and veggie burgers served with chips and salad, are standard pub grub menu items. Many pubs specialize in "gourmet" burgers. These are usually high quality minced steak patties, topped with items such as blue cheese, brie, avocado et cetera. Some British pubs serve burger patties made from more exotic meats including venison burgers (sometimes nicknamed Bambi Burgers), bison burgers, ostrich burgers and in some Australian themed pubs even kangaroo burgers can be purchased. These burgers are served in a similar way to the traditional hamburger but are sometimes served with a different sauce including redcurrant sauce, mint sauce and plum sauce. In the early 21st century "premium" hamburger chain and independent restaurants have arisen, selling burgers produced from meat stated to be of high quality and often organic, usually served to eat on the premises rather than to take away. Chains include Gourmet Burger Kitchen, Ultimate Burger, Hamburger Union and Byron Hamburgers in London. Independent restaurants such as Meatmarket and Dirty Burger developed a style of rich, juicy burger in 2012 which is known as a dirty burger or third-wave burger. In recent years Rustlers has sold pre-cooked hamburgers reheatable in a microwave oven in the United Kingdom. In the UK, as in North America and Japan, the term "burger" can refer simply to the patty, be it beef, some other kind of meat, or vegetarian. This hamburger in a fast food restaurant in Auckland, New Zealand contains beetroot for flavor. Fast food franchises sell American style fast food hamburgers in Australia and New Zealand. The traditional Australasian hamburgers are usually bought from fish and chip shops or milk bars. The hamburger meat is almost always ground beef, or "mince" as it is more commonly referred to in Australia and New Zealand. They commonly include tomato, lettuce, grilled onion and meat as minimum, and can optionally include cheese, beetroot, pineapple, a fried egg and bacon. If all these optional ingredients are included it is known in Australia as "burger with the lot". The term 'burger' is also applied to any hot sandwich using a bun for the bread, even when the filling does not contain beef, such as a chicken burger (generally with chicken breast rather than chicken mince), salmon burger, pulled pork burger, veggie burger, etc. The term 'sandwich' is usually only applied when the bread used is sliced bread. The only variance between the two countries' hamburgers is that New Zealand's equivalent to "The Lot" often contains a steak (beef) as well. The condiments regularly used are barbecue sauce and tomato sauce. The McDonald's "McOz" Burger is partway between American and Australian style burgers, having beetroot and tomato in an otherwise typical American burger; however, it is no longer a part of the menu. Likewise, McDonald's in New Zealand created a Kiwiburger, similar to a Quarter Pounder, but features salad, beetroot and a fried egg. The Hungry Jack's (Burger King) "Aussie Burger" has tomato, lettuce, onion, cheese, bacon, beetroot, egg, ketchup and a meat patty. In China, restaurants such as McDonald's and KFC exist, which sell hamburgers. In Japan, hamburgers can be served in a bun, called hanbāgā (ハンバーガー), or just the patties served without a bun, known as hanbāgu (ハンバーグ) or "hamburg", short for "hamburg steak". Hamburg steaks (served without buns) are similar to what are known as Salisbury steaks in the U.S. They are made from minced beef, pork or a blend of the two mixed with minced onions, egg, breadcrumbs and spices. They are served with brown sauce (or demi-glace in restaurants) with vegetable or salad sides, or occasionally in Japanese curries. Hamburgers may be served in casual, western style suburban restaurant chains known in Japan as "family restaurants". Hamburgers in buns, on the other hand, are predominantly the domain of fast food chains. Japan has homegrown hamburger chain restaurants such as MOS Burger, First Kitchen and Freshness Burger. Local varieties of burgers served in Japan include teriyaki burgers, katsu burgers (containing tonkatsu) and burgers containing shrimp korokke. Some of the more unusual examples include the rice burger, where the bun is made of rice, and the luxury 1000-yen (US$10) "Takumi Burger" (meaning "artisan taste"), featuring avocados, freshly grated wasabi, and other rare seasonal ingredients. In terms of the actual patty, there are burgers made with Kobe beef, butchered from cows that are fed with beer and massaged daily. McDonald's Japan also recently launched a McPork burger, made with U.S. pork. McDonald's has been gradually losing market share in Japan to these local hamburger chains, due in part to the preference of Japanese diners for fresh ingredients and more refined, "upscale" hamburger offerings. Burger King once retreated from Japan, but re-entered the market in Summer 2007 in cooperation with the Korean owned Japanese fast-food chain Lotteria. According to the Guinness World Records, a Japanese man, Takeru Kobayashi ate the greatest number of hamburgers in three minutes on July 11, 2014. 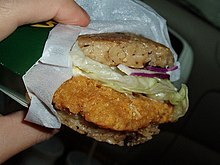 Rice burgers, mentioned above, are also available in several East Asian countries such as Taiwan and South Korea. Lotteria is a big hamburger franchise in Japan owned by the South Korean Lotte group, with outlets also in China, South Korea, Vietnam, and Taiwan. In addition to selling beef hamburgers, they also have hamburgers made from squid, pork, tofu, and shrimp. Variations available in South Korea include Bulgogi burgers and Kimchi burgers. In the Philippines, a wide range of major U.S. fast-food franchises are well represented, together with local imitators, often amended to the local palate. The chain McDonald's (locally nicknamed "McDo") have a range of burger and chicken dishes often accompanied by plain steamed rice or French fries. The Philippines boasts its own burger-chain called Jollibee, which offers burger meals and chicken, including a signature burger called "Champ". Jollibee now has a number of outlets in the United States, the Middle East and East Asia. Vada pav or "Indian Burger" is made of potatoes and spices. In India, burgers are usually made from chicken or vegetable patties due to cultural beliefs against eating beef (which stem from Hindu religious practice) and pork (which stems from Islamic religious practice). Because of this, the majority of fast food chains and restaurants in India do not serve beef. McDonald's in India, for instance, does not serve beef, offering the "Maharaja Mac" instead of the Big Mac, substituting the beef patties with chicken. 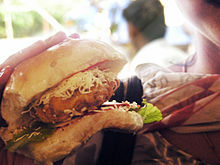 Another version of the Indian vegetarian burger is the Wada Pav consisting deep-fried potato patty dipped in gramflour batter. It is usually served with mint chutney and fried green chili. In Pakistan, apart from American fast food chains, burgers can be found in stalls near shopping areas, the best known being the "shami burger". This is made from "shami kebab", made by mixing lentil and minced lamb. Onions, scrambled egg and ketchup are the most may be toppings. In Malaysia there are 300 McDonald's restaurants. The menu in Malaysia also includes eggs and fried chicken on top of the regular burgers. Burgers are also easily found at nearby mobile kiosks, especially Ramly Burger. In Mongolia, a recent fast food craze due to the sudden influx of foreign influence has led to the prominence of the hamburger. Specialized fast food restaurants serving to Mongolian tastes have sprung up and seen great success. 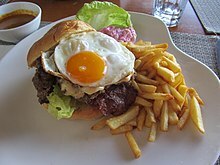 Beef burger with fried egg, cabbage and some french fries in Kota Kinabalu, Malaysia. In Turkey, in addition to the internationally familiar offerings, numerous localized variants of the hamburger may be found, such as the Islak Burger (lit. "Wet-Burger"), which a beef slider doused in seasoned tomato sauce and steamed inside a special glass chamber, and has its origins in the Turkish fast food retailer Kizilkayalar. Other variations include lamb-burgers and offal-burgers, which are offered by local fast food businesses and global chains alike, such as McDonald's and Burger King. Most burger shops have also adopted a pizzeria-like approach when it comes to home delivery, and almost all major fast food chains deliver. 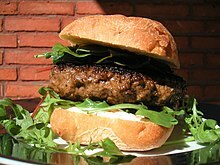 In the former Yugoslavia, and originally in Serbia, there is a local version of the hamburger known as the pljeskavica. It is often served as a patty, but may have a bun as well. Throughout Belgium and in some eateries in the Netherlands, a Bicky Burger is sold that combines pork, chicken, and horse meat. 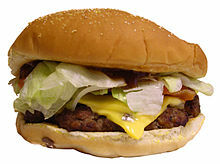 The hamburger, usually fried, is served between a bun, sprinkled with sesame seeds. It often comes with a specific Bickysaus (Bicky dressing) made with mayonnaise, mustard, cabbage, and onion. In May 2012, Serendipity 3 was recognized as the Guinness World Record holder for serving the world's most expensive hamburger, the $295 Le Burger Extravagant. At $499, the world's largest hamburger commercially available tips the scales at 185.8 pounds (84.3 kg) and is on the menu at Mallie's Sports Grill & Bar in Southgate, Michigan. It is called the "Absolutely Ridiculous Burger", which takes about 12 hours to prepare. It was cooked and adjudicated on May 30, 2009. New York chef Daniel Boulud created an intricate dish composed of layers of ground sirloin, foie gras, and wine-braised short ribs, assembled to look exactly like a fast-food burger. It is available with truffles in season. On September 2, 2012, the Black Bear Casino Resort near Carlton, Minnesota made the world-record bacon cheeseburger that weighed 2,014 pounds (914 kg). Guinness World Records verified the record for biggest burger. In Las Vegas, Nevada at the Heart Attack Grill there is a Quadruple Bypass Burger. The burger weighs two pounds and the name is derived from the fact that the burger is unhealthy. The restaurant is known for being honest about the fact that their food is unhealthy. They allow people that weigh over 350 pounds (160 kg) to eat free. On August 5, 2013, the first hamburger made from meat lab grown from cow stem cells was served. The hamburger was the result of research in the Netherlands led by Mark Post at Maastricht University and sponsored by Google's co-founder Sergey Brin. "$100 hamburger" ("hundred-dollar hamburger") is aviation slang for a general aviation pilot needing an excuse to fly. A $100 hamburger trip typically involves flying a short distance (less than two hours), eating at an airport restaurant, and flying home. Steamed hams is a fictitious name used for hamburgers originating in the Simpsons episode "22 Short Films About Springfield" as Skinner tries to convince the Superintendent that the term is used in Albany, New York. ^ Harper, Douglas. "hamburger". Online Etymology Dictionary. Retrieved October 17, 2009. ^ Harper, Douglas. "hamburg". Online Etymology Dictionary. Retrieved August 4, 2016. ^ McWilliams, Mark (April 6, 2012). The Story behind the Dish: Classic American Foods: Classic American Foods. ABC-CLIO. ISBN 9780313385100. ^ "Neuester, vollständiger Führer durch Hamburg, Altona und Umgegend : Mit Berücksichtigung von Kiel, Helgoland, Lübeck und Travemünde. Mit vielen lithogr. Abbildungen u. d. neuesten Plane der Stadt" [Newest, complete guide to Hamburg, Altona and surroundings. [...]]. Bavarian National Library Archives. Hamburg: J. F. Richter. 1869. Retrieved January 11, 2017. ^ "In a "Sandwich Car"". Chicago Daily Tribune. July 5, 1896. Retrieved August 7, 2014. ^ Rosa L. DeLauro (2000). Louis' Lunch. the Library of Congress. ^ a b Sam Gazdziak (August 1, 2006). "Giving the BURGER its due: the hamburger's origins are somewhat shrouded in mystery, but there is no doubt as to its impact on American dining habits and culture.(Editorial)." The National Provisioner. BNP Media. ^ a b c d e f g Nancy Ross Ryan (February 6, 1989). Great American food chronicles: the hamburger. (restaurant marketing). Restaurants & Institutions. Reed Business Information, Inc. (US). ^ Lance Gay Scripps (April 2, 2004). Birth of an icon: Hamburger's origins unclear, but it became popular 100 years ago. Deseret News (Salt Lake City). ^ Berman, John; Millhon, Drew (February 20, 2007). "A Major Beef! Who Invented the Hamburger?". ABC News. Retrieved May 24, 2014. ^ Louis' Lunch A Local Legacy. Library of Congress. Americaslibrary.gov. Retrieved on April 21, 2013. ^ New York Media, LLC (1977). New York Magazine. New York Media, LLC. p. 42. ISSN 0028-7369. ^ a b c Randall Beach (February 3, 2008) Louis' Lunch has beef with book claiming it didn't invent the hamburger. New Haven Register (New Haven, CT). McClatchy-Tribune Information Services. ^ a b c d e f g John E. Harmon "The Better Burger Battle", in Atlas of Popular Culture in the Northeastern United States. ^ ""Hamburger" Charlie Nagreen". SeymourHistory.org. Retrieved September 3, 2010. ^ Heuer, Myron (October 12, 1999). "The real home of the hamburger". Herald & Journal. Retrieved March 24, 2008. ^ Ozersky, Josh (2009). The Hamburger: A History. Yale University Press. p. 19. ISBN 978-0-300-15125-1. ^ John T. Edge (2005). Hamburgers & Fries: An American Story. G.P. Putnam's Sons. p. 22. ISBN 978-0-399-15274-0. ^ Michael Wallis; Marian Clark (2004). Hogs On 66: Best Feed and Hangouts for Road Trips on Route 66. Council Oak Books. p. 67. ISBN 978-1-57178-178-9. ^ a b Preusch, Matthew (October 26, 2007). "What's cooking America: History of the Hamburger". ^ Welcome To Weber's Superior Root Beer and Grill Archived January 14, 2013, at the Wayback Machine. Webersrootbeer.net (April 13, 1995). Retrieved on April 21, 2013. ^ "Obituary: Charles Menches". The New York Times. October 5, 1951. ^ Grivetti, Louis E.; Corlett, Jan L.; Gordon, Bertram M.; Lockett, Cassius T. (January – February 2004). "Food in American History, Part 6-Beef (Part 1): Reconstruction and Growth Into the 20th Century (1865–1910)". Nutrition Today. 39 (1): 18–25. doi:10.1097/00017285-200401000-00006. PMID 15076706. ^ Roger M. Grace (January 15, 2004). Old Menus Tell the History of Hamburgers in L.A. metnews.com. ^ "Hoover's Company Profiles: White Castle System, Inc". Answers.com. ^ Hogan, David Gerard (1997). Selling 'em by the Sack: White Castle and the Creation of American Food (1st ed.). NYU Press. pp. 52–55. ISBN 978-0814735671. Retrieved June 4, 2008. ^ "Ray Kroc Dies - McDonald's company history". Washington Post. ^ For references see the literature review in William O. Giles "Method for preparing hamburger patties" U.S. Patent 5,484,625 issued January 16, 1996. ^ Big Mac Hits The Big 4-0, CBS News, February 11, 2009. ^ "Anatomy of a Burger". The New York Times. October 4, 2009. Retrieved May 4, 2010. ^ a b Moss, Michael (October 3, 2009). "The Burger That Shattered Her Life". The New York Times. Retrieved May 4, 2010. ^ "Ground Beef and Food Safety". Retrieved July 26, 2016. ^ USDA Urges Consumers To Use Food Thermometer When Cooking Ground Beef Patties Archived September 3, 2009, at the Wayback Machine. United States Department of Agriculture Safety and Inspection Service Media Communications Office, August 11, 1998. ^ Orange Coast Magazine. Emmis Communications. May 2007. p. 254. ISSN 0279-0483. ^ Seenan, Gerard (October 4, 2004). "Highland schools get Bambi burgers". The Guardian(UK News). London. Retrieved May 4, 2010. ^ a b c Michael Karl Witzel, Gyvel Young-Witzel (2007). Legendary Route 66. p. 210. ISBN 9781616731236. ^ a b Annual Franchise and Distribution Law Developments. pp. 109–110. ^ Stone, Martha (August 10, 2014). Be Your Own Burger King. PJ Group. p. 14. ^ Croft, Sara (October 9, 2014). "Make your own great steak burger". The Indianapolis Star. Retrieved October 9, 2014. ^ Louie, Elaine (2008). London. ISBN 9781892145659. ^ "Steak Sandwich Around Australia". Outback Joe. April 2012. Retrieved July 18, 2017. ^ a b c Kearney, Syd (May 2, 2014). "One great dish: Signature Steak Burger at La Casa del Caballo". Houston Chronicle. Retrieved October 9, 2014. ^ The Little Black Book of Burgers. Peter Pauper Press, Inc. p. 99. ISBN 978-1441300409. ^ Motz, George (May 10, 2011). Hamburger America. pp. 41–42. ISBN 9780762440702. ^ a b Annual Review of Developments in Business and Corporate Litigation. pp. 1075–1076. ^ Serious Eats. pp. 80–81. ^ Brit at the Ballpark. p. 97. ^ Specialty Sandwich commercial (Television commercial). 1979. ^ Sasser Jr., W. Earl; Rikert, David C. (February 27, 1996). "Burger King Corp". Cambridge, MA: Harvard Business Review. Retrieved November 25, 2013. ^ a b Peter Shinkle (June 16, 2004). "Burger battle heats up in court". St. Louis Post-Dispatch. Metro. ^ "Steak 'n Shake sues Burger King over use of "steakburger" phrase". The Florida Times-Union. Associated Press. June 2, 2004. Retrieved February 22, 2015. ^ "How Much Does A 100x100 In-N-Out Cheeseburger Cost?". Robert Kaplinsky. ^ John T. Edge (July 29, 2009). "Pastrami Meets the Patty in Utah". The New York Times. ^ The Canadian Oxford Dictionary has headwords for the Canadianisms "kubasa", "kubie" (as a hot dog), and "kubie burger", the latter two being specific to Alberta. ^ The Low Carb Six Dollar Burger | Carl's Jr. Menu. Carlsjr.com. Retrieved on April 21, 2013. ^ McCracken, Jan (2005). Healthy Carb Cookbook For Dummies. For Dummies. p. 294. ISBN 978-0-7645-8476-3. ^ "Move over, Cronut! The new Ramen Burger has New Yorkers in a foodie frenzy". New York Post. August 21, 2013. ^ Schwartz, Jeremy (August 27, 2007). "Uncovering Mexico: Best of times, worst of times: Celebrating the 100th". Statesman.com. Archived from the original on November 2, 2007. Retrieved December 18, 2010. ^ "Wimpy History". wimpy.uk.com. Archived from the original on May 9, 2008. ^ Lacey, Josh (January 2, 2006). "Camembert with that, sir?". The Guardian (UK News). London. Retrieved May 4, 2010. ^ "Rustler's Microwave Quarterpounder 190g". sainsburys.co.uk. Retrieved April 25, 2010. ^ "Fed: Tough to swallow inflationary hamburgers". Australian Associated Press General News. Australian Associated Press. July 26, 2006. ^ Hay, Donna (November 24, 2002). "The new burger". Sunday Herald Sun. The Herald and Weekly Times. ^ "Hungry Jack's menu". Retrieved March 10, 2012. ^ "Ideaforesight: Upscale, modern fast food". ideaforesight's blog. ^ Fried lamb burger recipe on Recidemia. En.recidemia.com (July 15, 2012). Retrieved on April 21, 2013. ^ a b Steves, Rick (2015). Rick Steves Belgium: Bruges, Brussels, Antwerp & Ghent. Avalon Travel. ISBN 978-1631210655. ^ Smith, Andrew F. (2008). "The Global Burger". Hamburger a global history. London: Reaktion Books. ISBN 978-1861896315. ^ "Serendipity 3 - Burger Weekly". Burger Weekly. Burger Weekly. June 12, 2013. Retrieved October 8, 2013. ^ "Largest hamburger commercially available". guinnessworldrecords.com. Archived from the original on June 7, 2009. ^ Ungerleider, Neal (June 4, 2009). "10 Most Expensive Hamburgers". Forbes. Archived from the original on June 12, 2009. ^ Jessica Dickler (July 10, 2007) The DB "Royale" double truffle burger. Money.cnn.com. Retrieved on April 21, 2013. ^ Daniel Boulud. Topics.nytimes.com. Retrieved on April 21, 2013. 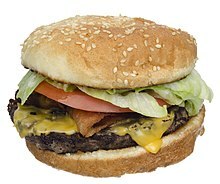 ^ "One-ton bacon cheeseburger sets record". CBS News. September 4, 2012. Retrieved September 4, 2012. ^ "Heart Attack Grill – Official site". Retrieved December 24, 2012. ^ Goodberry, Lane (August 3, 2012). "Good Nutrition: Something You Can Bet Your Life On". Hive Health Media. Retrieved December 24, 2012. ^ "World's first lab-grown burger is eaten in London". BBC. August 5, 2013. Retrieved August 5, 2013. ^ Matthew Preusch (October 26, 2007). Cleared for Lunching: The $100 Hamburger. NY Times. Trage (1997). The Food Chronology: A Food Lover's Compendium of Events and Anecdotes, From Prehistory to the Present. Owl Books. ISBN 978-0-8050-5247-3. Allen, Beth (2004). Great American classics Cookbook. Hearst Books. ISBN 978-1-58816-280-9. Smith, Andrew (2008). Hamburger: A Global History. Reaktion Books. p. 128. ISBN 978-1-86189-390-1.